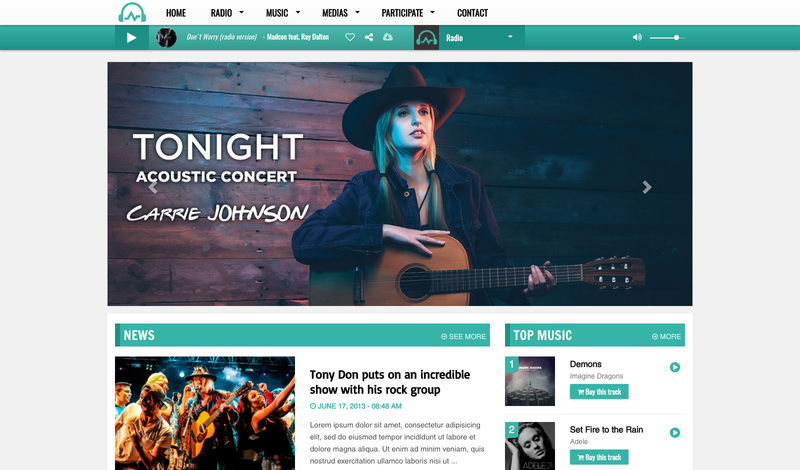 Create the ideal website for your radio station! Listening to your radio station has never been so simple. The radio website integrates a play bar visible on all pages. It allows you to efficiently convert your visitors into listeners thanks to a simple click of the play button. Moreover, it allows your visitors to continue navigating your website whilst listening to your radio station without any cuts! 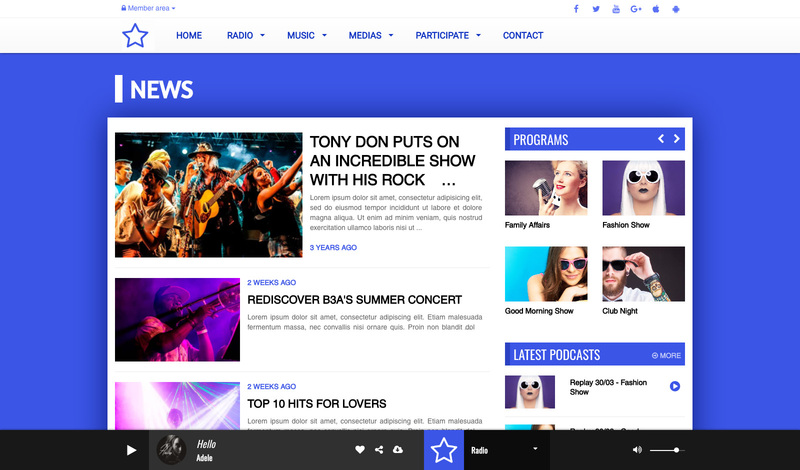 With the radio website, you can expect a beautiful design that reflects your radio station. Ergonomic, responsive, light and practical, it will undoubtedly charm your listeners and make them want to come back. The numerous options allow you to differentiate yourself from other radio stations and add that unique feature! Whatever the device used by your visitors, they’ll be able to find you. 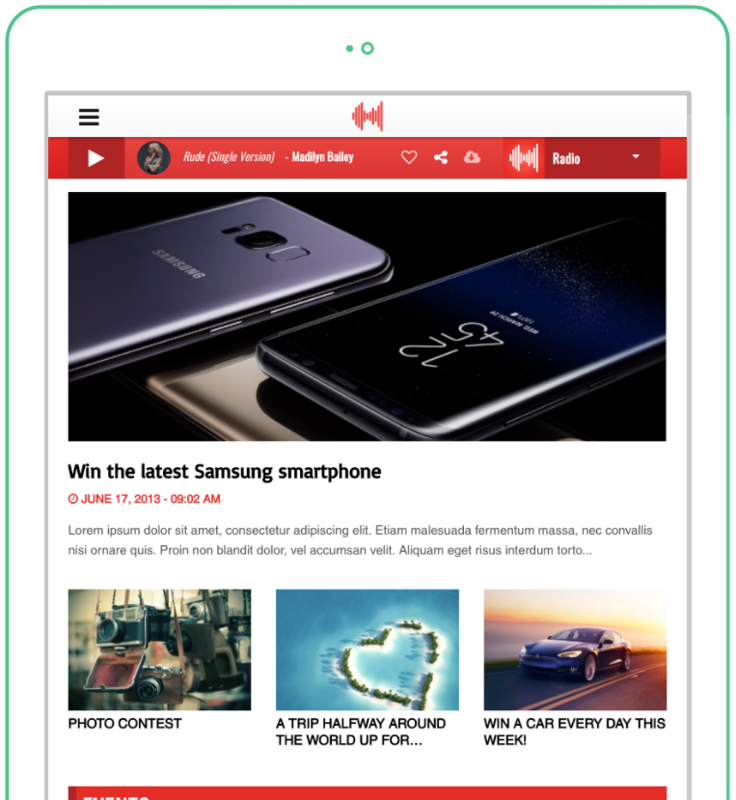 RadioKing allows you to create a responsive website, in other words, accessible on computers, tablets and smartphones. 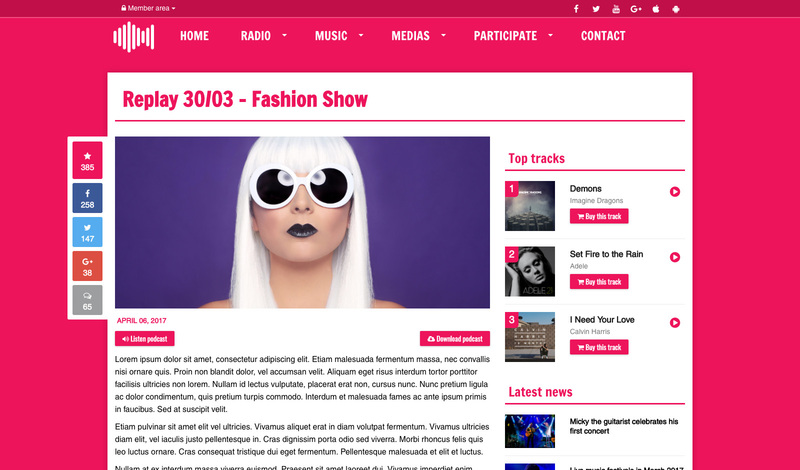 Create a website for your radio station! Try it for free for 7 days to build a website that reflects your radio station. 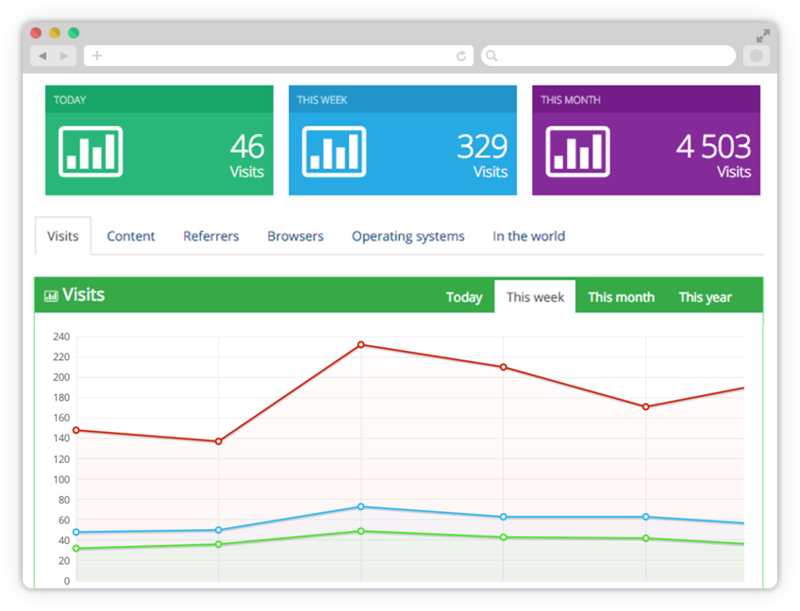 Simply modify the appearance of your website and view the results in real time. It's as simple as a text editor! Just like with a text editor. You can format your text directly online. 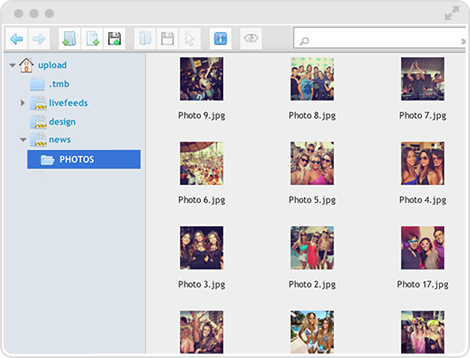 Easily manage your photos and add them to your articles using our media library. 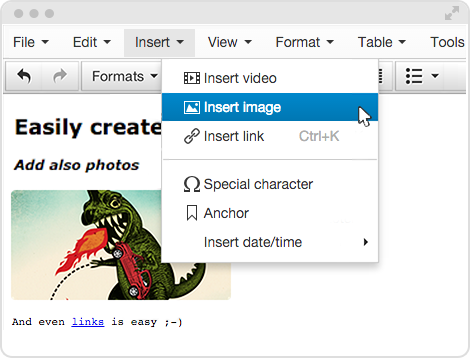 Finally, you can view, edit, delete and (un)publish all your content with a single click! It's as easy as formatting in Word! Manage your content with a single click! Easily add your podcasts, your listeners can either listen to them again or download them thanks to your website’s player. The radio website automatically recovers track titles broadcast on your radio station to present them in the What’s this track module. The radio website integrates an engaging show grid that showcases your lineup. The Playlist module is an excellent way of featuring tracks that you broadcast on a regular basis. 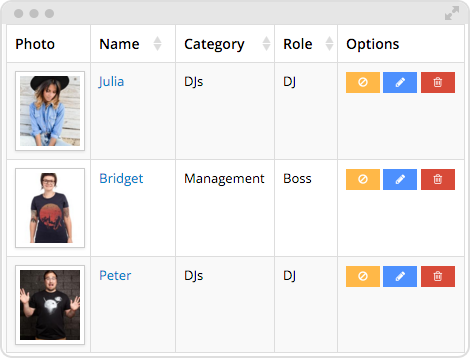 The Artist module allows you to easily feature artists regularly broadcast on your radio station. All the artist information is found automatically using external APIs. Your listeners can check out the bios, photos and other information. 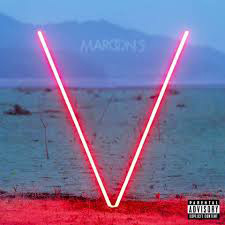 The artist's best tracks and albums are listed on their page. Plus you can listen to audio samples! Easily publish new games and contests to increase listener participation! Broadcast your audience's dedications on your station is a great way to gain their loyalty. Thanks to the Radio CMS, listeners can participate by voting for their favorite tracks! 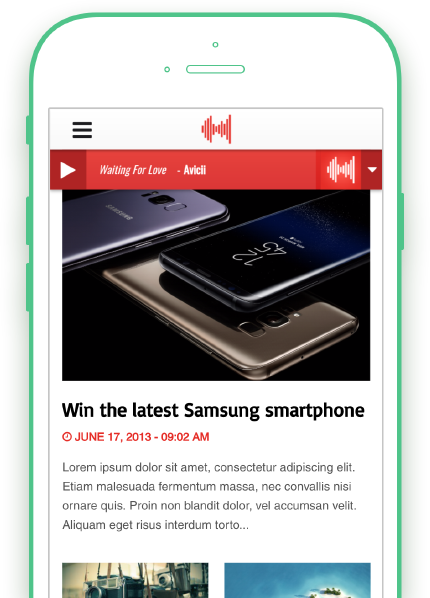 Your visitors can comment on any post on your Radio Site. 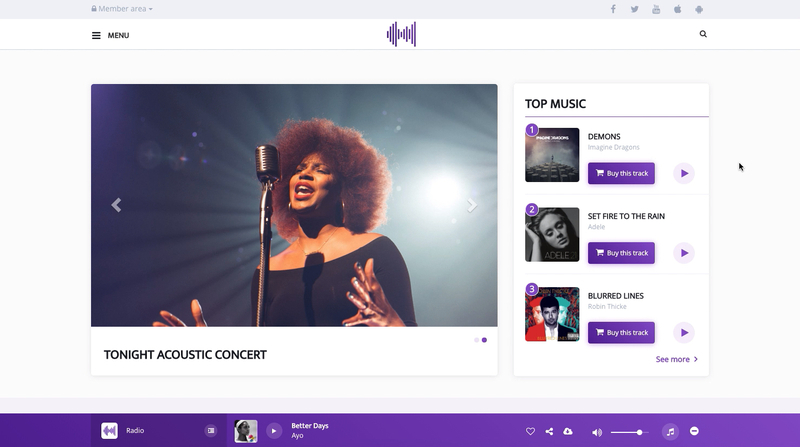 Your listeners can chat in real time with you and other listeners thanks to the Chat feature. Visitors to your page can share any of your articles via social networks. The Radio CMS includes a members-only space that your listeners can register for with, letting you build a real community. With advanced access rights management, you can define the specific rights of each user. Online radio stations are usually managed by a team. This is why the Radio Site allows for multiple administrators. See all your statistics with a single click and learn about discover your listeners' profiles! 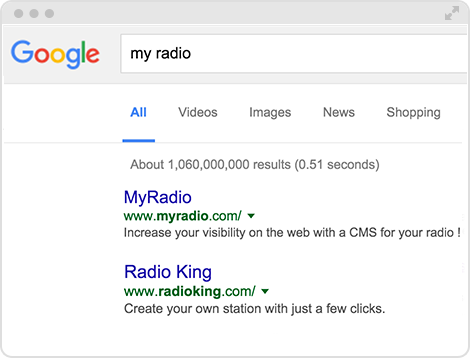 The Radio CMS displays the essential information you need to manage your radio station. Connect your Google Analytics account to your site to get even more statistical data. Even if you don't know a thing about SEO, you’ll be able to create a site that works well in search engines, especially Google. For example, we have optimized the addresses of your site pages to improve your search engine ranking. The titles of your articles appear in the URL. The risk of duplicate content is avoided because a canonical URL is added systematically. If you want to take your indexing one step further, you can define a specific title, description and key words for each module on your site. 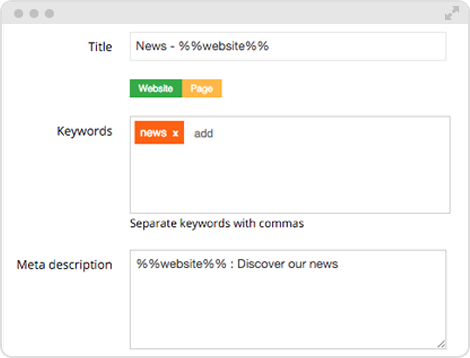 Plus predefined tags allow you to let you add dynamic information (category and item names, publication date, etc). Your site map is automatically generated and contains all the links for your website. Just submit them to the various search engines for instant inclusion. It's fast and simple: we take care of everything! Quick, reliable and secure, RadioKing offers a quality hosting service. We closely monitor the status of our servers and update their components regularly. From security improvements to new features, you will never have to manage updates. They are automatically applied to your Radio website. We guarantee 99% availability for our hosting service and the swiftest response time possible. Hosting performance is a crucial factor for optimal use. Type here the name of your radio, you can change it later.